As some of you may know, I recently returned from a trip to visit Ariel in London. We did a whole lot of tourism, but not necessarily the most traditional kind. For instance, while we did go to Buckingham Palace, it was not for the changing of the guards, and while we did go to the Tower, we spent a lot of time being enthusiastic about the Princes In the Tower and the Overbury Scandal and did not see the crown jewels at all. In general, there were three main themes to our tourism: (1) the Undead (2) Renaissance court scandals (3) Mocking the Victorians. About points (2) and (3) there may be more later. For now, I present a portion of the Molly and Ariel Undead Tour of London: Zombies Wilde and Bentham. Zombie Oscar Wilde can be found near the Charing Cross tube station, Trafalgar Square, and Covent Gardens. He is officially a statue called “A Conversation With Oscar Wilde.” Created by Maggie Hambling in 1998, the original intention of the statue, as far as I can tell, was to provide an interactive statue, a bench that one can sit on and have conversations with Wilde. 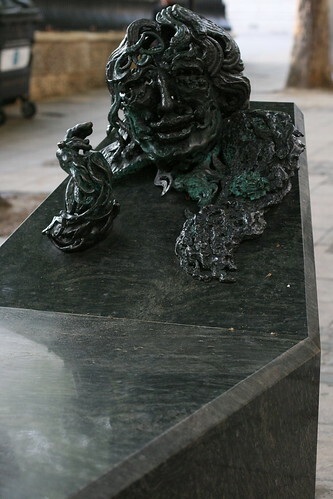 The base of the statue reads “We are all in the gutter, but some of us are looking at the stars,” which perhaps implies that this particular incarnation of Wilde is spending his time on the sidewalk looking up out of a determined effort to live out his afterlife as a quotation, just as he lived out his life. But the bench looks like a coffin and Wilde looks like he is decomposing, from the shape of the body, to the oxidized metal that forms him, to the fact that there are, mysteriously, starfish-shaped bits in his head. So, despite the flamboyant expression and the green carnation, the net effect is really rather creepy. When I saw the flamboyant statue of Wilde in Dublin I didn’t think that there could be a creepier incarnation (the Dublin statue looks like he is about to mock or molest the passerby). It turns out I was wrong. Zombie Jeremy Bentham is something completely different. Rather than being a creepy zombie-like statue, Zombie Bentham is in fact the preserved skeleton of philosopher Jeremy Bentham, dressed in his clothing and in his accustomed position of thought. He wears a wax head, his actual skull being stored safely in the UCL archives. Bentham’s “Auto-Icon” was created according to a mandate in his will, and has been at University College London since 1850. For a long time I asked myself: what is the purpose, from a Utilitarian perspective, of requiring that your body be preserved in a glass case with your name on it and put in a place for people to visit? It seems like rather a lot of work that doesn’t really do anyone much good. 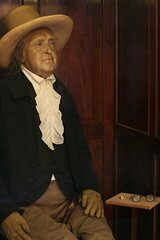 Having now visited the Auto Icon, I can say for certain: Zombie Jeremy Bentham has high utility, because he is AWESOME. I was giddier with Zombie Bentham than I was at any other time in my trip, despite seeing the Rosetta Stone on the same day. Rumor: Students from King’s College once stole Bentham’s head and used it as a football. Fact: This never happened. UCL stored his head for safekeeping for a different reason entirely. Response: Why do you make life less fun, UCL? And what ::are:: you protecting his skull from, if it is not dangerous football players from other academic institutions? Rumor: Zombie Bentham, as a founder of UCL, attends all university council meetings and votes in the case of ties. He almost always votes in favor of the position. Fact: Bentham wasn’t actually a founder of UCL, just a muse for the founders. He doesn’t vote. He is a zombie. That is ridiculous. Response: If Bentham was not a founder of UCL, why does the tag under his name on the auto-icon claim that he was a founder of the institution? And if he doesn’t vote, how do you resolve ties? Rumor: Molly claimed while visiting zombie Bentham that he was her first true love. Fact: Why would you think this? That is nonsense. She clearly said that they had a longstanding casual relationship that bore no reflection on primary relationships in her life. Obviously. To find Zombie Bentham go to either the Euston Square or Warren Street Tubes. Enter UCL on Gower Street between Grafton Way and University Street. Follow the signs to the South Cloisters, enter the building. There is a map inside that will direct you to Bentham, who is at the end of the hall. Alternately, you can make a full day of your zombie travels by walking north through the city, starting with Oscar Wilde, taking a break to visit the mummies at the British Museum, and finally wrapping up your afternoon with Jeremy Bentham. Trust me, if you like the undead it’s the ideal way to pass an afternoon. 2 Responses to "Two zombies"
Was that a reference to William Carlos Williams in there? It’s funny, I was just discussing with a friend the frequency of poetic allusions in everyday speech and writing, because they are very difficult for non-native speakers to pick up on, and I was very proud to have picked up a snippet of Hafez on my Persian test. I’m glad I recognized your bit as well, as it’s something I probably read one time in high school literature class. I just found your post lurking in my spam filter and approved it. Sorry, looks like you were a false positive. Yes, it was a William Carlos Williams reference. I have a hard time using the expression “Forgive me.” without thinking of Williams. And I love finding literary references in everyday speech too. Congrats on picking up on Havez in your Persian test.